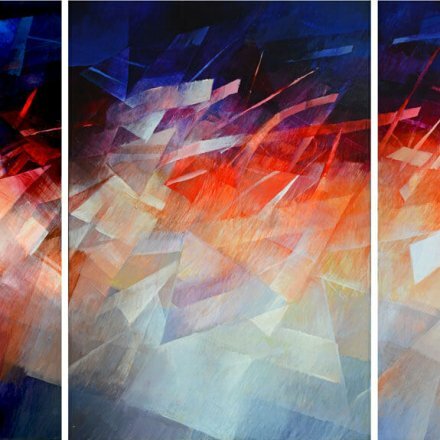 “Why, Why, Why” Triptych Painting, Modern Abstract Art, Acrylic on Canvas. Each piece measures 68″ x 45″. The Daily News, by Caran-Marie Zambo – “Why, Why, Why” painted in shades of purple, blue and brown, depicts three panels each framing a view of the sky or heavens. What is outside shines through each “frame” and the glint of light spirals out in repetitions of the familiar three-pronged shape of the letter Y.